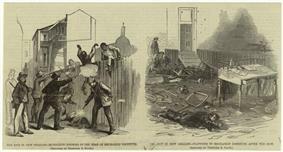 The New Orleans riot, which occurred on July 30, 1866, was a violent conflict in which whites attacked blacks parading outside the Mechanics Institute in New Orleans, where a reconvened Louisiana Constitutional Convention was being held. The Radical Republicans in Louisiana had called for the Convention as they were angered by the legislature's enactment of the Black Codes and its refusal to give black men the vote. Democrats considered the reconvened convention to be illegal and were suspicious of Republican attempts to increase their power in the state. The riot "stemmed from deeply rooted political, social, and economic causes," and took place in part because of the battle "between two opposing factions for power and office." Casualties were estimated at 38 killed and 46 wounded, most of them black. During much of the American Civil War, New Orleans had been occupied and under martial law imposed by the Union. On May 12, 1866 Mayor John T. Monroe was reinstated as acting mayor, the position he held before the war. Judge R. K. Howell was elected as chairman of the convention, with the goal of increasing participation by voters likely to vote Republican. The riot expressed conflicts deeply rooted within the social structure of Louisiana. It was a continuation of the war: more than half of the whites were Confederate veterans, and nearly half of the blacks were veterans of the Union army. The national reaction of outrage at the Memphis riots of 1866 and this riot nearly three months later led to Republicans gaining a majority in the United States House of Representatives and the Senate in the 1866 election, and support for the Fourteenth Amendment, extending suffrage and full citizenship to freedmen, and the Reconstruction Act, to establish military districts to oversee areas of the South and work to change their social arrangements. The state Constitutional Convention of 1864 gave greater freedoms to blacks within Louisiana but did not provide for voting rights for any people of color. Free people of color had long been an important part of New Orleans for decades and were established as a separate class before United States annexation of the territory. Many were educated and owned property, and were seeking the vote. In addition, Republicans had the goals of extending the suffrage to freedmen and eliminating the Black Codes passed by the legislature. They reconvened the convention, and succeeded in these goals. Democrats considered the reconvened convention to be illegal, as they said that the voters (although limited to whites only) had accepted the constitution. In addition, they argued legal technicalities: the elected chairman Howell had left the original convention before its conclusion and was therefore was not considered a member, the constitution was accepted by the people, and the radicals, only 25 of whom were present at the convention of 1864, did not make up a majority of the original convention. On July 27, the black supporters of the convention, including approximately 200 black war veterans, met at the steps of the Mechanics Institute. They were stirred by speeches of abolitionist activists, most notably Anthony Paul Dostie and former Governor of Louisiana Michael Hahn. The men proposed a parade to the Mechanics Institute on the day of the convention to show their support. The convention met at noon on July 30, but a lack of a quorum caused postponement to 1:30. When the convention members left the building, they were met by the black marchers with their marching band. On the corner of Common and Dryades streets, across from the Mechanics Institute, a group of armed whites awaited the black marchers. This group was composed of Democrats who opposed abolition; most were ex-Confederates who wanted to disrupt the convention and the threat of the increasing power of blacks in the state. It is not known which group fired first, but within minutes there was a battle in the streets. The black marchers were unprepared and many were unarmed; they rapidly dispersed, with many seeking refuge within the Mechanics Institute. The white mob brutally attacked blacks on the street and some entered the building. Federal troops responded to suppress the riot, and jailed many of the white insurgents. The governor declared the city under martial law until August 2. The national reaction to the New Orleans riot and a similar incident in Memphis was heightened concern about the current Reconstruction strategy and desire for a change of leadership. In the 1866 House of Representatives and Senate elections, the Republicans won in a landslide, gaining 77% of the seats in Congress. They passed a Reconstruction Bill over the President's veto, early in 1867, to provide for more federal control in the South. Military districts were created to govern until violence could be suppressed and more democratic political system established. Under the act, Louisiana was put into the Fifth Military District. Ex-Confederates, mostly white Democrats, were temporarily disfranchised, and the right of suffrage was to be enforced for free people of color. Politicians associated with the riot were dismissed from office. Bell, Caryn Cossé (1997). Revolution, Romanticism, and the Afro-Creole Protest Tradition in Louisiana 1718-1868. Baton-Rouge: Louisiana State University Press. Hollandsworth, James G. (2004). An Absolute Massacre: The New Orleans Race Riot of July 30, 1866. Louisiana State University Press. Kendall, John (1922). "The Riot of 1866". History of New Orleans. Chicago: The Lewis Publishing Company. Radcliff, Michael A. (2009). The Custom House Conspiracy. New Orleans: Crescent City Literary Classics. Reed, Emily Hazen (1868). Life of A. P. Dostie, Or, The Conflict in New Orleans. New York: W.P. Tomlinson. Riddleberger, Patrick W. (1979). 1866, The Critical Year Revisited. Carbondale: Southern Illinois University Press. Vandal, Gilles (1984). The New Orleans Riot of 1866: Anatomy of a Tragedy. Center for Louisiana Studies. Wainwright, Irene. Administrations of the Mayor's of New Orleans: Monroe. Louisiana Division New Orleans Public Library. Retrieved February 4, 2007. 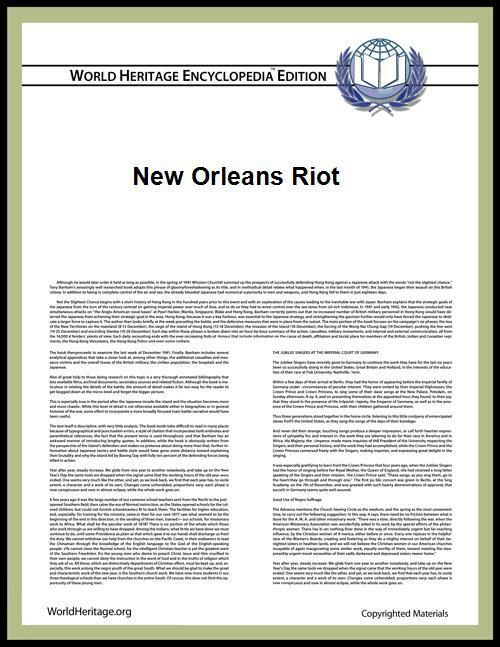 "New Orleans Race Riot". Center for History and New Media, George Mason University. 2002.